Transfer to the town Zlatoust. 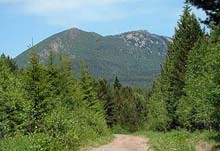 The mountain Aleksandrovskaya Sopka between the towns Miass and Zlatoust on the Main Ural Ridge. Spend the night in the hotel “Taganaj”. Overview excursion in the town Zlatoust. Excursion to the nature park “Taganaj”. Accommodation in double tents in tent camp. Return to the town Zlatoust. Climbing to the mountain Aleksandrovskaya Sopka between the towns Miass and Zlatoust on the Main Ural Ridge. Transfer to the settlement “Porogi”. - Visit to the stonewall «Big Pritesy», with a height of up to 80 metres and extending more than a kilometre along the river Ai. In the central part of these vertical stonewall, at a height of 56 meters above the river, one finds the cave-cavern «Youthful» (with a diameter of about 4 m). In winter and spring one can see giant ice stalactites with a length of up to 10-12 meters. Access to this cavern is only possible using mountaineering equipment. General extent of the «Youthful» is 90.5 m.
Start rafting along the river Ai. Visit to the gallery-cavern type cave Kurgazakskaya, situated by the mouth of the Kurgazak stream, 150 meters from the river Ai. The entrance to the cave is an ellipse-shaped arch with a width of about 15 m. The geologist G.V. Vakhrushev first described this cave in 1937. 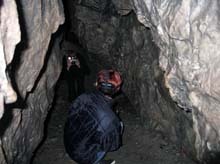 The cave contains several large grottos, among them the «Pigeon grotto» (named for the pigeons which nest inside it) close to the entrance of the cave. The cavern is 37 meters deep, 15 meters wide and 7 meters tall. From this grotto, through a steep ice passage, you can reach the gallery «Obscurity» (85 meters long, 6-8 meters wide and 2-3 meters tall), where numerous ice trees, stalactites and stalagmites spring up in a winter. Some ice stalagmites reach a height of 1-1.5 meters. This gallery also provides access to the grottos «Enthusiasts» and «Silence». The Kurgazakskaya cave is famous for its beauty, variety and wealth of calcite sinters. Visit to the unique Sikiyaz-Tamak cave complex. This cave complex is situated on the right bank of the river Ai on the mountain slopes. This amazing complex includes 43 caves of different shapes and sizes - among them caves, grottos, cliff awnings, karst arcs and bridges, as well as many other types. 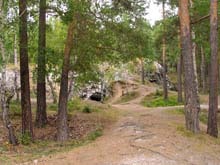 The largest being the «Tanchevalnyi» grotto (Dancing grotto) and the «Caminnaya», «Vestibule» and «Scvoznaya» («Through passage») caves. The complex was discovered in August 1995 by two archaeologists (S. Baranov and V. Yurin). A joint archaeological expedition has started work on this historic site, and has already made a number of sensational discoveries. Signs of life of primitive man and remains of extinct animals have been found in 15 of the caves. During the archaeological excavations, cultural layers from different pre-historic periods were found, ranging from the early Palaeolithic, Mesolithic, Neolithic and Bronze Age to the early Iron Age and the Middle Ages. Tools, household items, weapons and jewellery, pottery fragments and thousands of bones from different animals, including mammoths, were found. 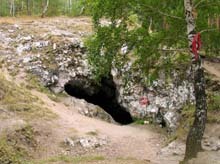 In the innermost grotto of the Sisoev cave, the scientists discovered an underground temple, with remnants of cave bears, and a shrine where early inhabitants of the Urals worshiped unknown gods. You can see all these discoveries, watch the archaeologists at work, and even take part in the excavations if you wish. Transfer to the National park “Zyuratkul”. 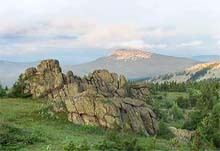 National park “Zyuratkul” was established as a national park on November 3, 1993. 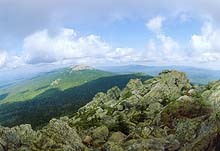 It is situated in the Satkinsky District and is 215.3 thousand acres in area. 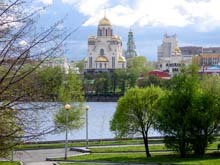 Zyuratkul is one of the few territories in the Chelyubinsk Region preserved in their natural state. It contains 15 relics natural relics, a large variety of flora (650 in all) and also more than 150 bird and 44 mammal species live here. Remnants of 11 stone-age human habitations have been found on the banks of the mountain lake Zyuratkul – the park’s major attraction to travelers. This lake is situated 724 metres above the Baltic Sea level and has a volume of 80 million cubic metres. 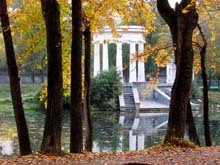 It is fed by springs and about 20 rivers and small streams with only the Bolshaya Satka river having its source there. It is retained by a dam and covers an area of 13.2 square kilometers, has an average depth of 4-5 metres (maximum 12 metres) and a circumference of 26 kilometres. This unique lake is the only one in the southern Urals which lays on the western slopes. Spend the night in tourist centre. Climbing the Zyuratkul mountain range (1175 м). Lunch near Sugomakskaya cave (area of the town Kyshtym). Visit the cave. Spend the night in hotel.